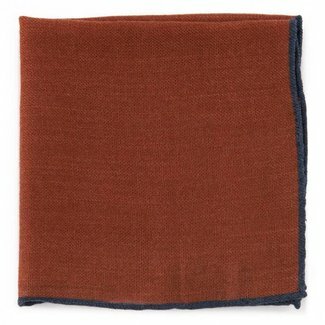 Drake's pocket square rust made of wool. 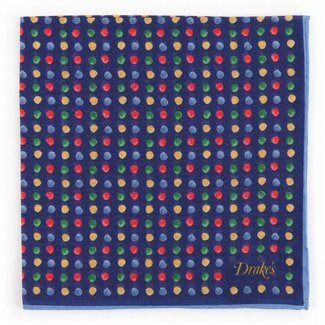 An original must-ha..
Pocket square blue with painted spot pattern, made by Drake'..
Add a dash of pattern and muted colour to your jacket with t..
Drake's blue tie in wool. 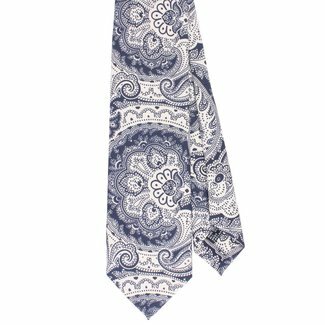 Sophisticated Drake's tie in blue with a subtle pattern. 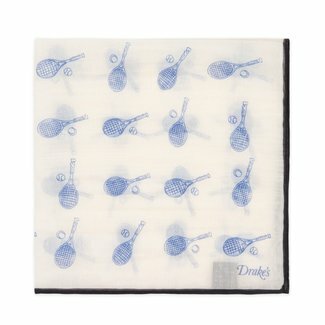 Thi..
Pocket square with a whale print in blue, combined with oche..
Blue pocket square of Drake's with tennis racquet print. 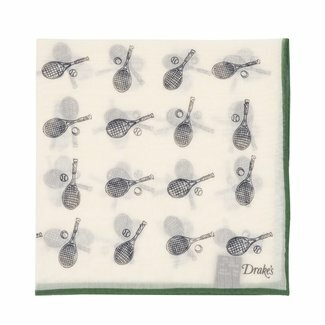 White pocket square of Drake's with tennis racquet print. 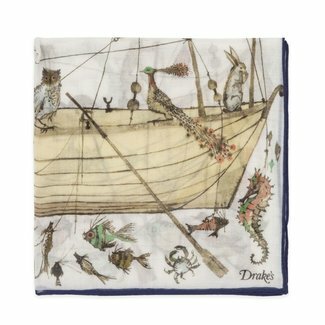 White pocket square of Drake's with Noah's Ark. 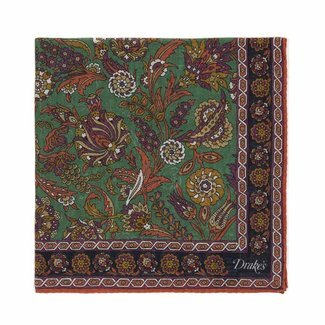 Drake's pocket square rust with a vintage flower print. 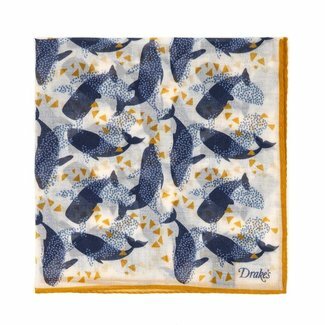 Drake's pocket square navy with a vintage flower print. 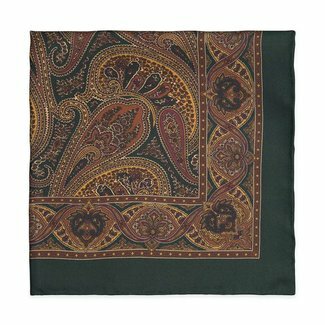 Drake's pocket square green with a vintage flower print. Drake's beige tie with a woven pattern. 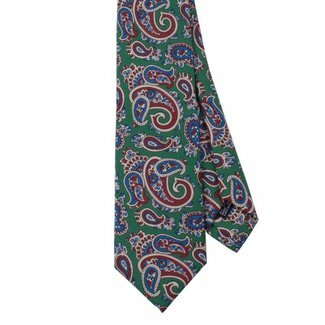 This men's tie is ma..
Drake's tipped jacquard silk green tie in a beautiful weave ..
Drake's tipped jacquard silk navy tie in a beautiful weave f..
Drake's tipped jacquard silk beige tie in a beautiful weave ..
Drake's paisley tie green made of silk. Sophisticated green Drake's tie for men. 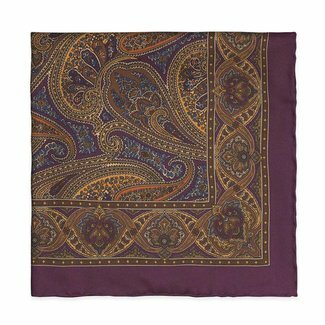 This luxury green t..
Drake's men's silk scarf in the color brown combined with an..
Drake's men's silk scarf in the color navy combined with an ..
Beautiful Drake's navy silk tie with a block pattern in red ..
A rich navy tie featuring a unique and jaunty hand-painted s..
Drake's paisley tie white made of silk. Drake’s London is a premium quality men’s accessories brand, founded by Michael Drake back in 1977. 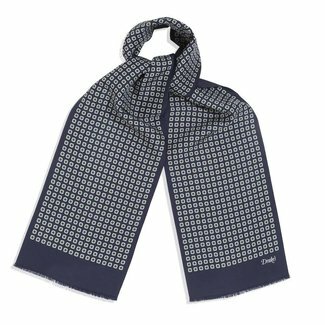 The original Drake’s London collection was made of quality men’s scarves; however it was quickly expanded to feature an exquisite range of handmade ties and pocket squares, perfect for the stylish gentleman. Over the years, the company has won numerous awards for its designs and achievements, including the Queen’s Award for Export and the UK Fashion Export Gold Award for Outstanding Export Achievement. To this date, Drake’s continue to create their handmade ties, pocket squares and scarves in London’s East End on Haberdasher Street. Dedicated to achieving excellent attention to detail and accessories of the highest quality, you can be certain that any purchase from our range of Drake’s London products is a sound style investment. 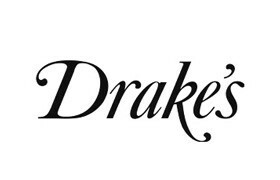 As an authentic London brand, Drake’s style has always reflected elements of true English heritage. Over the years, the designers have also drawn inspiration from the French and the Italians because let’s face it, they’re two very stylish nations. Their aesthetic is a representation of how English style is perceived to be, rather than its reality, which is often far less stylish. If you are looking for timeless accessories to decorate your classic business attire and quality heritage clothing, our collection of Drake’s ties, pocket squares and scarves is guaranteed to impress. You could be wearing the finest quality suit in the world but without paying attention to details such as your tie or pocket square, you will never be fully dressed. These rather simple details are what will take your attire to the next level and make you stand out for all the right reasons. Drake’s London is all about paying attention to detail. Take a look at the accessories in their collection and you’ll see they have been exquisitely designed. From the patterns on their pocket squares to the weave of their woolen products, everything is precisely manufactured by hand to achieve the highest levels of quality design. The right choice of tie, pocket square and scarf can give your outfit a certain je ne sais quoi. Here we’ve shared a few tips on how to dress to impress. A simple, crisp shirt in blue will always make an excellent choice for business wear. Blue is a colour you can trust. Opt for two-ply cotton or an Oxford weave to ensure a quality aesthetic. 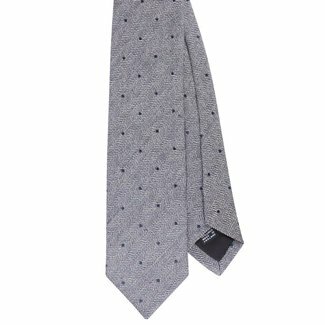 Your tie will be the focus of attention; therefore it’s important to invest in a quality design. 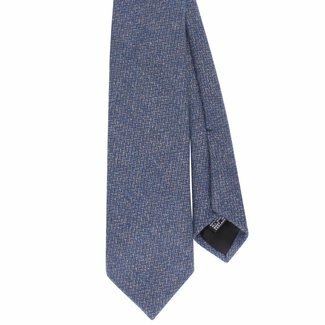 Drake’s London believes that handmade ties are the only choice to consider. 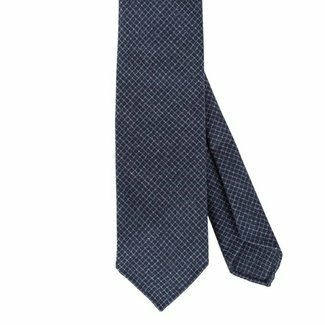 All of their ties are the perfect width – they’re not too wide or too small, so you can be rest assured they’ll be perfect for any occasion. Tie patterns shouldn’t be over the top or feature too many colours. 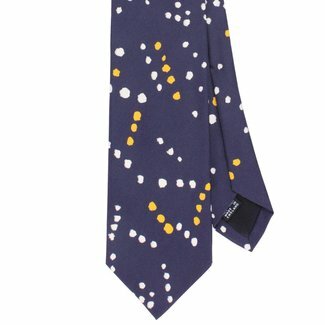 Navy, grey and purple are ideal for the evening or business wear. Lighter colours should be worn in the morning and slightly deeper in the afternoon. A great choice of tie will guarantee a good start to your day. Your clothing and accessories say a lot about you, so make sure they are saying the right things. Add personality to your outfits with the help of Drake’s London. 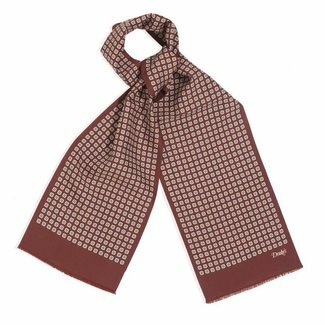 Their ties, pocket square and scarves are available in a variety of colours and patterns, with something to suit every gentleman out there. Enjoy browsing our Drake’s London collection and if you have any questions, please don’t hesitate to get in touch.